Our digital devices are much more than the sum of their parts, they're our life. That collection of metal, plastic, silicon, glass and copper holds the keys to our dreams, our visions, our recreation, our work - our life. We understand this and are wholly committed to maintaining the full potential and value of your window to the world. Born in 2002, RadTech descended from a medical hardware and software project called Radiologic Technologies whose not for profit mission entailed improving the accuracy and efficiency of cancer treatment. 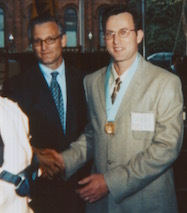 Radiologic's mission was a success and our founder was named a Smithsonian Laureate in 2000. The project was subsequently archived in the National Museum of American History. During the course of the medical project, three vitally necessary solutions were engineered in-house to significantly prolong the life span of expensive, yet fragile portable computers in order to make the treatment benefits viable and sustainable for rural and third-world treatment centers operating on increasingly tighter budgets. Soon after these solutions began appearing on our distributed computers, requests from individuals desiring the solutions for their personal notebooks began pouring in faster than we could respond. Within a very short time, RadTech was spun off as a separate entity producing computing solutions. The product line quickly grew from three, to over 1300 solutions and continues to expand. It's our sincere pleasure to serve you and to help you get the most from your computers and digital devices. Macworld San Francisco - Are We Ready? RadTech has utilized and relied upon the outstanding e-commerce and marketing services provided by GiftOasis LLC for over a decade. Their personalized approach to providing e-commerce and marketing services is refreshing. If you are in need of such services, we wholeheartedly recommend that you give them a look. We also wish them great success on their plans to create a gift marketplace that sells unique gifts made by small businesses. It's been an absolute pleasure working with them.